This post is from the Archives. As our Advent journey draws to a close, as we come to the cusp of the Christ Mass, our thoughts turn to Mary. The ark of the new covenant, mother to beloved disciples, mother of God, queen of heaven, or simply the greatest Christian who ever lived. The language Christians us to speak of this remarkable young teenage girl who carried God incarnate within herself, magnifying the lord in her very flesh, has varied through the centuries. Some ignore her essential role in the history of salvation and her place of respect in the early Christian communities. Others seem to elevate devotion to Mary to a level reserved for Christ. It is also not unreasonable to question what sort of impossible ideal the Virgin Mother sets for Christian women and even men. Yet as the 16th century carol proclaims Mary heralded that a time of Grace had truly come. The Angel greets her saying. Greetings, favoured one! The Lord is with you. (other ancient texts add) Blessed are you among women. ‘Favoured one’ can also be translated as "to have grace shown, or bestowed upon, one" or to be full of Grace - as the first line of the ‘Hail Mary’ used in various forms by Eastern and Western Christians for over 1000 years. Mary proclaims the time of grace which she had received fully, in her song of joy: the Magnificat. In these words Mary herself is deeply aware of both her lowliness and her blessedness, of both her willing participation and God’s sovereign action. For the Jewish people the soul did not reside in the head or the heart, but in the inward parts, in the stomach area, even the womb. It was here that the Lord was magnified; Jesus as both man and God was brought into focus as she acted as a lens for the incarnation. The baby she carried inside her body as she sang truly was the wonderment of nature, the renewal of the world, the opening of a gate that had been closed. The Lord said to me: This gate shall remain shut; it shall not be opened, and no one shall enter by it; for the Lord, the God of Israel, has entered by it; therefore it shall remain shut. Only the prince, because he is a prince, may sit in it to eat food before the Lord; he shall enter by way of the vestibule of the gate, and shall go out by the same way. Who is this gate, if not Mary? Is it not closed because she is a virgin? Mary is the gate through which Christ entered this world, when He was brought forth in the virginal birth and the manner of His birth did not break the seals of virginity. The early Fathers also held that in not breaking the seals of virginity Mary experienced no pain in childbirth, citing the prophet Isaiah. Carry the weight of the child she must, as any other pregnancy, even if she was spared the accompanying pains. But what she was to carry through her life was a far greater thing, the pains she experienced at the foot of the cross - a deeper rending. As Simeon prophesied when the infant Christ was brought as a first born child to the temple. The true birth pangs experienced by Mary were the piercing of her soul as Jesus her Son was crucified experiencing the weight of the sins of the world. She too must have experienced an echo of that ultimate suffering through her love, as her soul continued to magnify the Lord, now in pain rather than joy. No other apart from Christ can have suffered as she did. A great portent appeared in heaven: a woman clothed with the sun, with the moon under her feet, and on her head a crown of twelve stars. She was pregnant and was crying out in birth pangs, in the agony of giving birth. … And she gave birth to a son, a male child, who is to rule all the nations with a rod of iron. Images in revelation have rich multiple readings. The woman is Israel, the woman is the Ark of the Covenant, and the woman is also Mary. The first Ark contained the most precious remains of God delivering his people from slavery in Egypt. Hebrews speaks of its contents. In it stood the golden altar of incense and the ark of the covenant overlaid on all sides with gold, in which there were a golden urn holding the manna, and Aaron’s rod that budded, and the tablets of the covenant; above it were the cherubim of glory overshadowing the mercy-seat. Of these things we cannot speak now in detail. The first Ark carried angelic food, Priestly authority of grace and judgement, and the words of God. Mary carried the same but greater, Jesus who is our heavenly food in the sacrament, Jesus who is our high Priest at that offering, Jesus who is the Word of God. The Israelites treated the first Ark with respect - we too honour Mary as the Ark of the new covenant. But the first Ark was kept closed. From the new Ark, Mary, the gate of grace is wide open. We too share the same grace that filled Mary from a young age, we follow in her footsteps as her children. 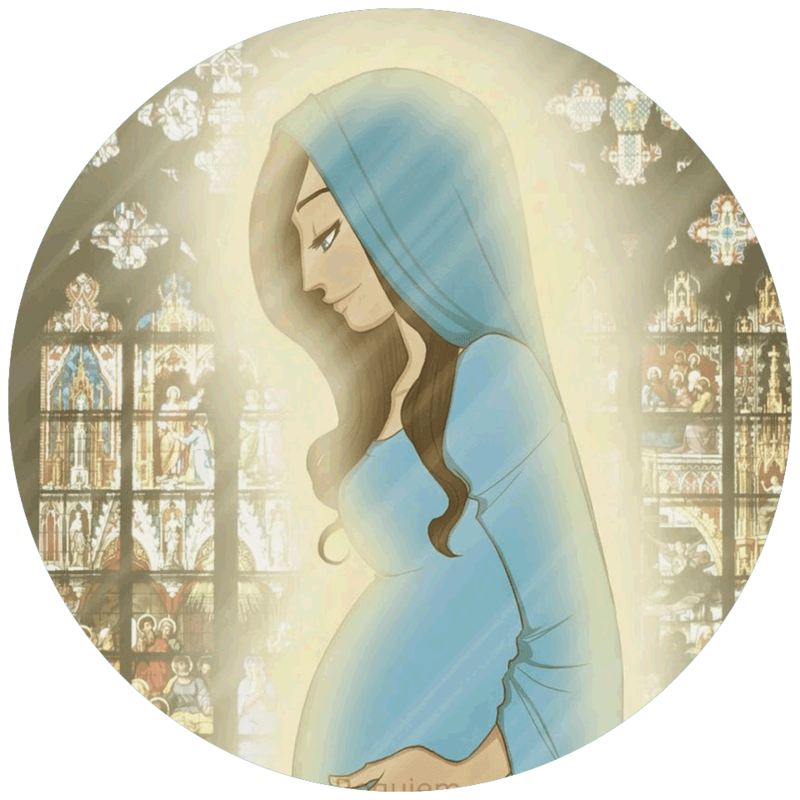 In holding the testimony of Jesus and the commandments of God we are Mary’s Children, and she is rightfully our mother. When we accept Mary as our mother, when we meditate on Mary, when we pray with Mary, when we come to her as the open Ark, when we seek her guidance as the lens of the incarnation, when we honour Mary, she always points us to the one she carried within but is available to us. Let us receive Him again as The Word, as our High Priest and as the Bread of Heaven today.